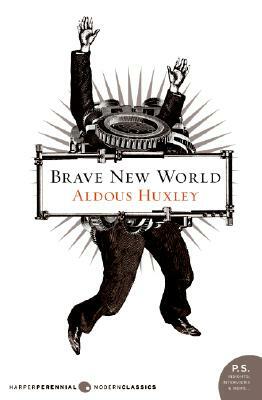 I’ve known for years that I ought to read Brave New World, that it’s a Classic, and one of those books that are the Foundations of Science Fiction. M has read it twice, though Hubby has yet to read it all the way through (shocking!). Thankfully, the Nook voted to read this one this past month, and I was able to take time away from my Cybils duties to squeeze in a bit of Huxley. And my mind was boggled. First off because this story was published in 1932. People! Aside from a some archaic treatment of Native Americans (a bit on the glorification side, and he called them Savages), it was mind-blowingly modern. His core ideas: that through science we would develop classes of humans, and brain wash them to be happy/content in their situation in life; that we would, through public policy, get rid of individualism and thereby ridding the world of wars and disagreements; that we, through tradition and education, would get rid of families and home, are all still issues that, for better or worse, are discussed today. And there you have it, in a nutshell. Brilliant. I read this in high school and thought it was brilliant then, but for some reason have never revisited it. Jason read it recently for his book club at work, and was talking about things he didn't notice from his high school read. I should def revisit!